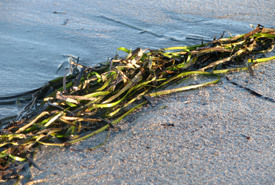 Eel-grass, a type of seagrass, has long, bright-green, ribbon-like blades that reach up to one metre in length. This plant is found along North America’s Atlantic and Pacific coasts, as well as Hudson Bay. Its complex root system allows it to anchor itself to the floors of shallow bays, coves, lagoons, tidal creeks and estuaries. What is its ecological role? Eel-grass helps improve water quality by filtering and trapping sediment, pollutants and nutrients. Beds support many marine invertebrates and provide spawning and nursery habitat for numerous fish, resulting in important feeding areas for marine birds and mammals. Although not endangered, eel-grass is highly susceptible to human interference. Shade from docks, floating log booms and algae also threaten this species. Wasting disease, caused by a marine slime mould, affects some Atlantic populations. A relatively recent threat to eel-grass is the European green crab, an invasive species that cuts the grasses while digging in sediment for food. What is its conservation status? 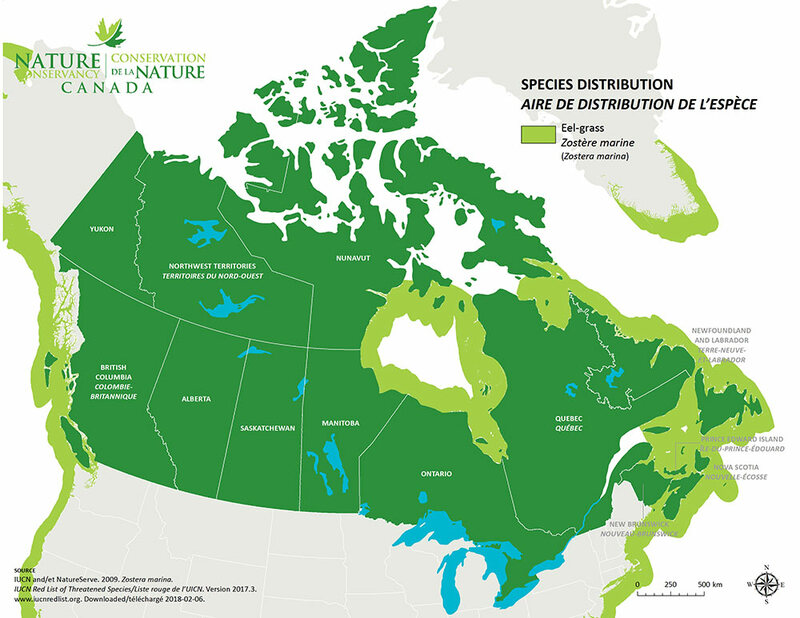 Eel-grass has no official status in Canada. However, NatureServe ranks it as imperilled in Ontario and Manitoba, and vulnerable in Quebec and Newfoundland and Labrador. What is NCC doing to protect habitat for this species? NCC has made several efforts to conserve eel-grass. In 2014, staff in Nova Scotia partnered with the Province of Nova Scotia and used aircraft and satellite imagery to map and monitor eel-grass beds in the Pugwash Estuary and Musquodoboit Harbour. The following year, NCC trapped European green crabs at the Pugwash Estuary to determine this invasive species’ population size. In addition, NCC has acquired valuable coastal land along Nova Scotia’s Northumberland Strait, which includes important eel-grass beds. NCC has also protected upland areas around estuaries in New Brunswick, such as those at Tabusintac. In British Columbia, NCC has helped restore eel-grass populations in the Campbell River Estuary on Baikie Island by replanting native vegetation in marshes along rivers and streams. NCC staff have also identified eel-grass as a target species for coastal conservation projects, such as Grace Islet, Clayoquot Island and Gullchucks Conservation Area.